The latest data from California’s Water Resources Control Board show 700,000 Californians are currently being exposed to contaminated water at home or at school. Because the state data doesn’t account for the nearly 2 million Californians still relying on private wells or factor in contamination from Chromium-6, experts say the number of people with toxic water is likely even higher. In addition to those with contaminated water, another 3,511 California households reported having wells that are still dry according to state data released in January, 2017. The vast majority of those wells are located in California’s Central Valley, in places like Tulare County, Madera County, and Stanislaus County. 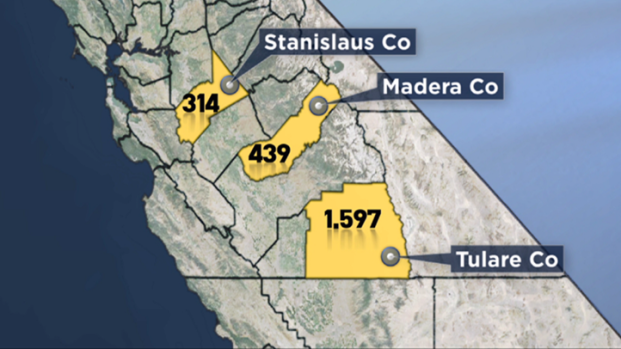 These Central Valley counties report having the most dry wells of anywhere else in the state. Five years ago Jerry Brown signed legislation making California the first state in the nation to declare that access to clean, safe drinking water is a fundamental human right. But NBC Bay Area's investigation found that promise has yet to reach more than a million California residents living in mostly rural, poor communities in the Central Valley and Central Coast. The Community Water Center actually estimates the true number of residents currently living without safe, clean drinking water exceeds one million people. Firestone said the tainted water found in wells and public water systems contains everything from naturally occurring arsenic and uranium, to nitrate from fertilizer and dairy farm waste runoff. “As the groundwater has become more contaminated, as we’ve started over-pumping our groundwater sources, it’s harder and harder to make sure that the water that people get in their tap is safe,” Firestone said. Other health effects include everything from rashes to stillborn babies, Firestone said. When asked if these communities were in crisis, Firestone was unequivocal. State data shows 292 different California water systems currently contain levels of contaminants so high they violate safe drinking water standards. The true number is likely higher considering the state data doesn’t factor in communities with Chromium-6 in their drinking water, or other contaminants such as “1,2,3-TCP”, a chemical that will soon be given a maximum contaminant level under California’s drinking water standards. Click here for a description of each contaminant and the possible health effects associated with long-term exposure. For more details, visit the state's Human Right to Water Portal. “We talk a good game about taking care of these people and everybody’s great about talking about it, but when it comes down to it, when it comes down to the brass tacks, they don’t put their money where their mouth is,” said California Assemblyman Devon Mathis. The two-term Republican, who served 10 years in the Army National Guard, including two tours in Iraq, grew up in the Porterville area. Tulare County resident Esperanza Venegas remembers when the well providing water for her family dried up last year. Like thousands of others in the community, the mother of four isn’t hooked up to a public water system. Instead, she gets her water from a private well. And just like thousands of others like her, Venegas’ drinking water stopped flowing when groundwater levels drastically fell during years of record drought. “I cry sometimes because there’s no water,” Venegas said. Down the road from Venegas’s house, the impact of California's drought is more apparent than just about anywhere else state. In unincorporated East Porterville, thousands of residents have had no running water for nearly three years. That crisis has forced residents to rely on hand-delivered bottled water to drink and water delivered by ltrucks to large, green tanks looming in front yards all over town for washing and cleaning. 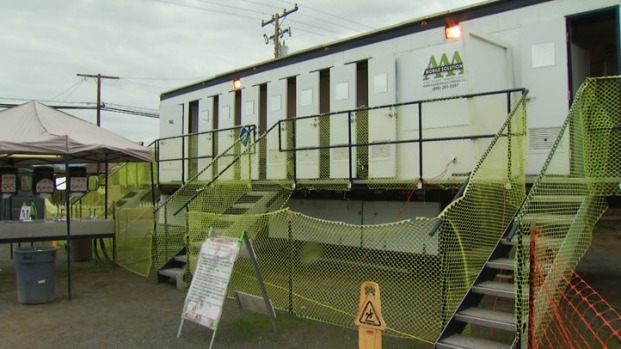 The dry wells also force many residents to to bathe in portable, public showers set up in a church parking lot. Hundreds of residents in East Porterville come to bathe in these portable showers set up in a church parking lot. “I used to go out and the flowers that my dad had brought me, my sister, my mom -- they’re all gone,” said 96 year-old Vicky Yorba as she looks out over her yard, which is nothing but dirt and mud now. But Yorba says the crisis has gone on so long that she’s all cried out. 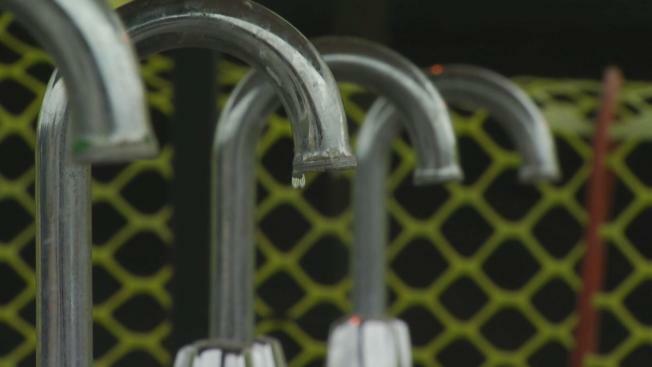 Though local and state officials recently began connecting some East Porterville residents to a nearby public water system, there are about 800 eligible homes still waiting to be hooked up. Experts say even more residents living in the most rural parts of the county are too isolated for officials to help. Their wells have run dry and their only option is to drill deeper. In many cases those wells are also contaminated, leaving residents with tough choices. Feinstein teamed with four other experts to author a report issued in January 2017 that focused on the human toll of California’s five-year historic drought. The team documented shortages and price hikes that affected thousands of residents’ access to safe and affordable water in communities like East Porterville. 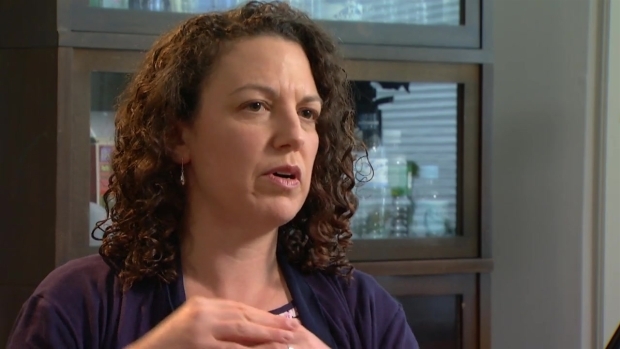 The Pacific Institute’s Laura Feinstein explains how California’s historic drought has impacted mostly rural, economically disadvantaged communities the most. While the state has made progress in getting clean drinking water to rural residents, Felicia Marcus, chair of California’s Water Resources Control Board, said there’s more to do. But water has historically been managed locally in California, so state agenices are limited in what they can accomplish alone. Although more than a million residents are estimated to be impacted by contaminated water, Marcus said many of California's urban dwellers don't always comprehend the scope of the problem. “There’s a bit of out of sight out of mind when the vast majority of people live along the coast in large urban centers,” Marcus said. So far, only one forced consolidation has taken place, although the Board is currently considering 70 small water agencies as possible candidates for consolidation. Officials say there could be even more after that, but it only works in areas where there’s close proximity between struggling water agencies and water agencies with more resources and capabiliites. The other problem is funding. The Water Board has been disbursing millions of dollars in grant money to build treatment centers and other infrastructure across the state. But the trouble is, after treatment centers and infrastructure projects are built, many small communities don’t have the resources to operate or maintain them. To clear that hurdle, Marcus said state lawmakers will have to decide if they want to fund the annual operation and maintenance costs of those facilities, something that will require a two-thirds vote to pass. None of these efforts can come fast enough for residents struggling to get by with dry taps or contaminated water. Residents such as Esperanza Venegas, who worry that her community has been forgotten by the rest of California.